Schezwan Parata is a stuffed parata inspired from the Chinese Cuisine. This stuffed Indian flatbread has loads of veggies and abundant flavors induced by the Schezwan chutney. 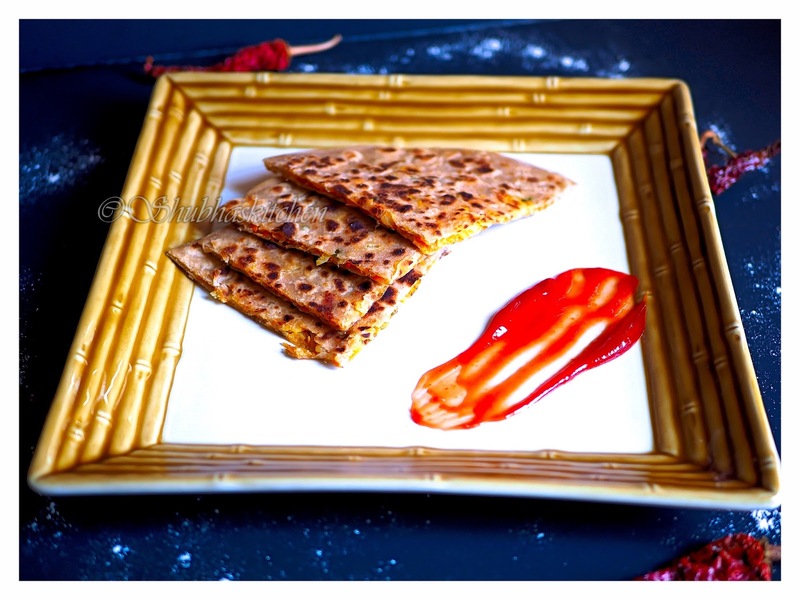 This post is a part of the Blog Hop event "Flatbreads". I regularly prepare Schezwan Noodles and my family loves it. That's when I thought that I could use the same chutney in my filling for this parata. I tried and loved it. These paratas are very filling and make a great breakfast option as well are ideal for lunch boxes. Additional whole wheat flour for dusting. Take 2 cups of the wheat flour in a large mixing bowl. Add salt to it.Adding water little by little to the flour , knead it into a soft dough (soft but not sticky and not very loose). I used approximately 1 cup of water).Add 1 tbsp of oil and give it a final knead. Cover the dough and set it aside to rest for 20 minutes. Heat oil in a pan. When hot, add the onions, green chilles, ginger and garlic. Saute for a minute.Add the veggies and mix well. Add the schezwan chutney, salt and pepper. Cook until all the veggies are cooked and most of the moisture has evaporated from the mixture.Once done, turn off the heat and set it aside to cool. Add the grated paneer. Mix well. Filling is ready. Take out two balls of dough. Dust them with flour. Roll each of these balls into a 4 to 5 inch circles. P.S: Try making each of these circles of the same size. Take one rolled circle. Place the veggie filling on it. Pressing it slightly.Leave some space at the edges. Over this place the second rolled circle. Press the edges and seal it with your finger tips. 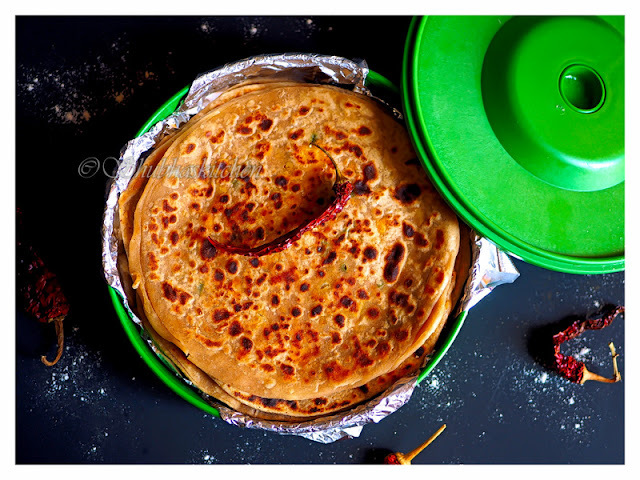 Dust some flour on it and roll it lightly to get a 8 inch parata. Heat a tava / griddle. When the pan is really hot, add the rolled parata. 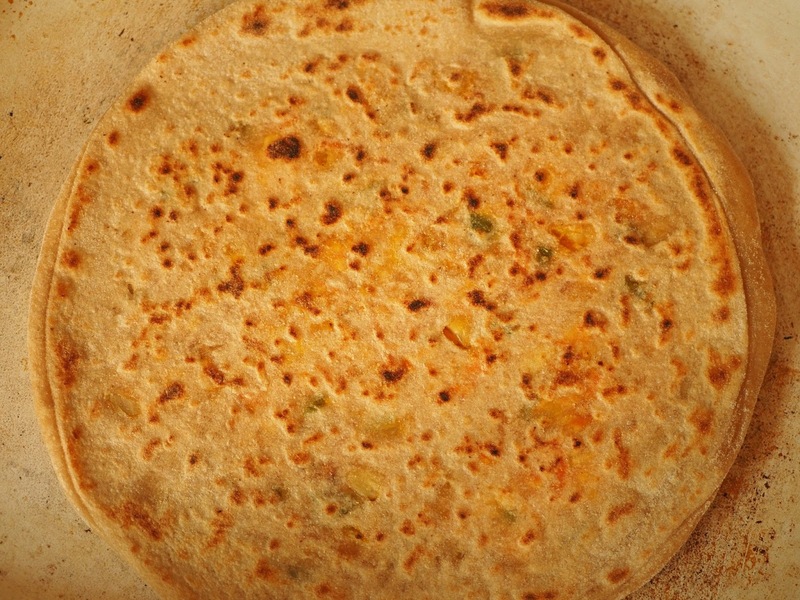 When the base is partially cooked, flip the parata. Apply some oil on the top surface. Flip it. Apply oil to the other side as well. 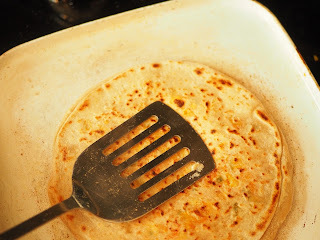 Using a flat spatula, press the surface of the parata so that every part is well cooked.When you get good brown spots on both sides of the parata, remove from the pan and store it in an insulated container. 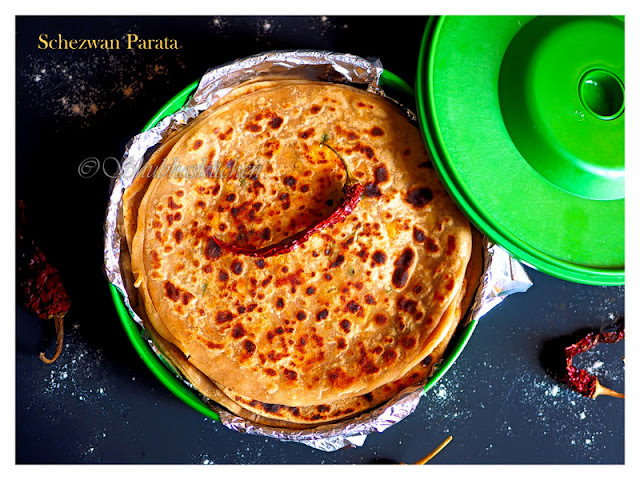 Prepare the remaining paratas in the similar fashion, cook and stack them in an insulated container.Serve Schezwan parata hot with some tomato ketchup. This looks absloutely delicious. I am sure my children will like it. Thanks for sharing Shubha. Shubha this truly is awesome and I want to try this right away. 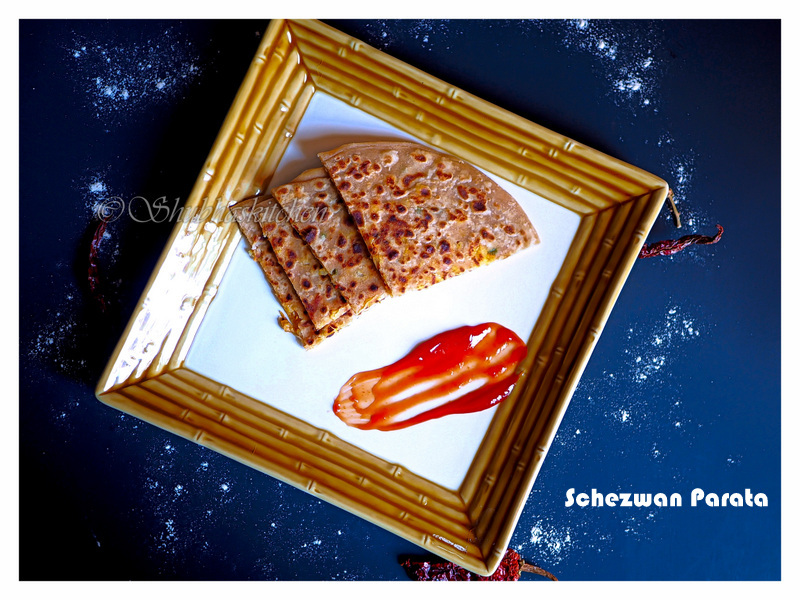 What a brilliant idea to include the slightly spicy, flavour packed schezwan chutney in the parata filling. I loved the idea of the veggies which makes this so nutritious. The images clearly are a testimony to the fact that deliciousness is seeping through the paratas. So wonderfully explained with easy and very clear instructions. Loved this post thoroughly. Loved the idea of schezwan paratha..as duch I love the noodles version....Well explained and executed...Good one Shubha!! Oh! 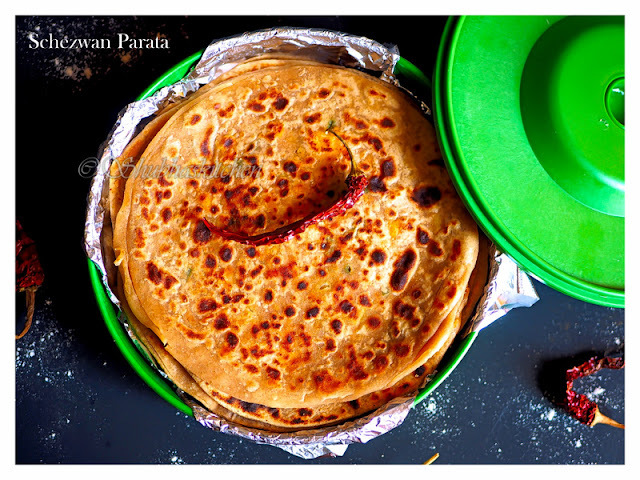 An interesting and definitely delicious Parathas.. love the color on those gorgeous parathas. I'm sure they taste as delicious as they look. Great share dear! Aha! Thumbs up for this clever invention. The marrying of Indian and Chinese ingredients for the wonderful outcome. Loved.